The high-resolution, 9.7-inch LED-backlit IPS display on iPad is remarkably crisp and vivid. Which makes it perfect for web browsing, watching movies, or viewing photos. With iPad, there is no up or down. It’s designed to show off your content in portrait or landscape orientation with every turn. And because it uses a display technology called IPS (in-plane switching), it has a wide, 178° viewing angle. So you can hold it almost any way you want and still get a brilliant picture, with excellent color and contrast. 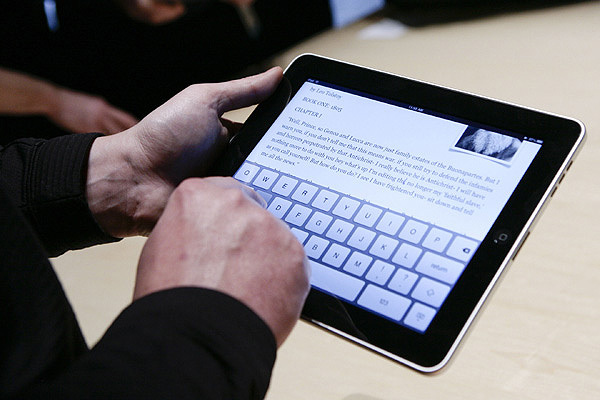 One of the first things you’ll notice about iPad is how thin and light it is. The screen is 9.7 inches measured diagonally. So overall, it’s slightly smaller than a magazine. At just 1.5 pounds and 0.5 inch thin,1 you can use it anywhere. And a slight curve to the back makes it easy to pick up and comfortable to hold. The first thing that I pay attention to in a touch device is how “responsive” it is. Despite the vastly superior resolution, when compared to the iPhone, the iPad is just as responsive (or may be even more so) than the iPhone 3GS. The overall 2D graphics speed is very good, there’s no question about that. Because it is so fast, the user interface responds right away to input, which makes the user feel in control. With the exception of the Zune HD, I have never used a device that’s more responsive than the iPhone 3GS, and now, the iPad.